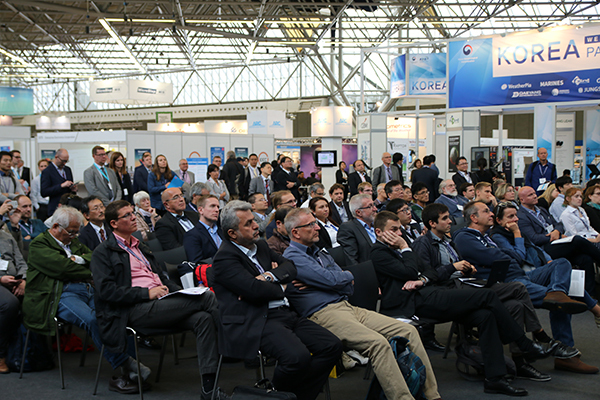 Meteorological Technology World Expo 2017 sees more visitors and more new products than ever before! 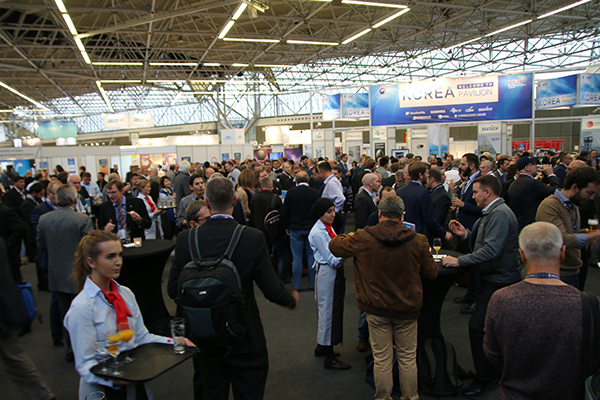 Visitors to the 2017 edition of Meteorological Technology World Expo in search of the latest new technologies and solutions to enhance their forecasting abilities and observation accuracy were rewarded with more new product launches than ever before, from a truly global mix of exhibitors from Europe, USA, Korea, Japan, China and India. 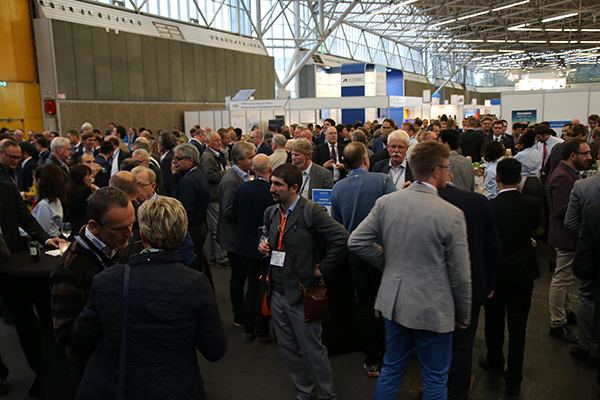 The show, now in its seventh year, saw over 4,000 attendees from 100 countries, and was held at the RAI Amsterdam, Netherlands from 10-12 October. 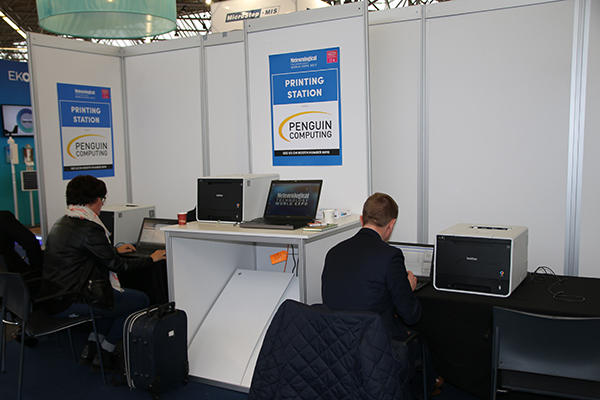 Some 180 exhibitors were present, taking the opportunity to unveil a host of innovations with more useful features than ever before. 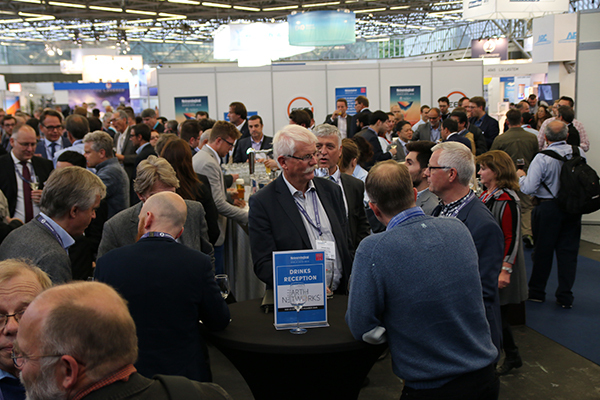 In particular, attendees showed strong interest in instruments and services capable of delivering ever more precise and individually tailored data suited to particular customer needs. For example, Vaisala reported a particularly enthusiastic response to its Observation Network Manager NM10 solution, which enables remote monitoring and control of weather observation networks on one central, secure and automated platform. NM10 is an automated network management system that connects individual systems, sensors and devices so that customers can easily monitor and control their sites and access their weather observation data from anywhere. Vaisala says NM10’s advanced diagnostics and data analytics services, together with remote monitoring, ensure customers have easy access to field devices to quickly and efficiently identify and solve problems, providing continuous high-quality data and lower lifetime costs. 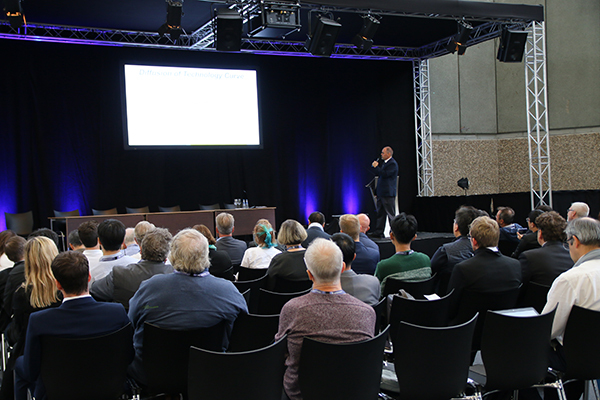 Kisters and MeteoGroup chose Meteorological Technology World Expo as the ideal venue to unveil HydroMaster, a new cloud service for weather information, forecast and warnings. The product was developed in response to extreme precipitation events that are increasing in frequency and heaviness due to increased urbanisation, population growth and climate change. Such events pose a direct threat to life, health, infrastructure, production and assets. To limit the impact of heavy rain events, HydroMaster helps local authorities, cities and municipalities, infrastructure owners and utility companies be better informed and prepared, and take preventive actions in a more timely manner. HydroMaster offers a live web service for viewing, analysing and archiving historical, current and upcoming precipitation events in a web browser. The service integrates observation and forecast data based on calibrated, high-resolution rainfall radar, and visualises information for individual hotspots in maps, graphs and tables. Customers can enter their own hotspots, zones and catchments, define their own alerts and create their own dashboards. “You can really paint your own area of interest, where you type in your thresholds and get a very individual forecast, providing an individual visualisation and alarm status of your specific areas of interest – your own assets, catchments, etc. So if you are a football stadium, for example, you can get a warning before the cloud burst comes,” explained Michael Natschke, business development, BU Water, Kisters. Radiometer Physics presented its new 94GHz FMCW Doppler cloud radar, following its first delivery last year. The operation frequency of 94GHz allows for higher sensitivity but with a smaller form factor than X- and Ka-band radars, and the system’s relatively small size and low weight make it suitable for mobile measurement platforms. Its short wavelength and high average transmitted power (1.5W) provide a high sensitivity of -45dBZe at 5km with 1.7 s averaging time, according to the company, which also claims the radar can reach a Doppler resolution of 1.7cm/s (512 FFT points) or even higher. The need for ever more precise and relevant information was echoed by Plair, whose purpose-built PlairGrid is designed for allergy professionals, as well as meteorological and environmental services, to provide a more affordable solution for the automatic detection of pollen. The solution leverages Plair’s all-optical Rapid-E instrumentation, which is powered by artificial intelligence, to automatically identify and count the most common allergenic pollen species in real time. 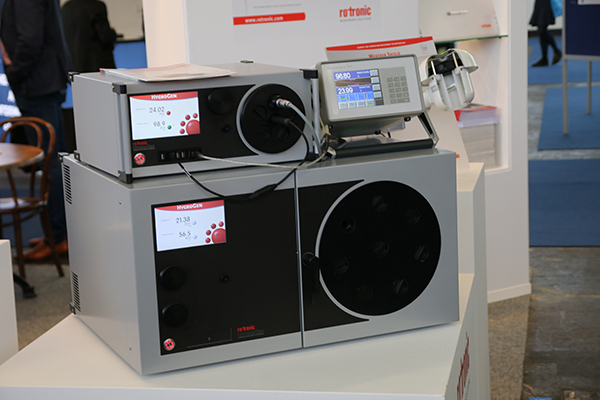 Plair says Rapid-E is free of any software or dataloggers and is easy to use. Analysed real-time data is delivered to an online dashboard – PlairGrid – which enables users to view and manage hourly and daily counts of different pollen types together with total pollen and particle count. Plair’s real-time pollen information improves forecasting models with better predictions compared with current weekly forecasts, leading to a better quality of life for allergy sufferers. 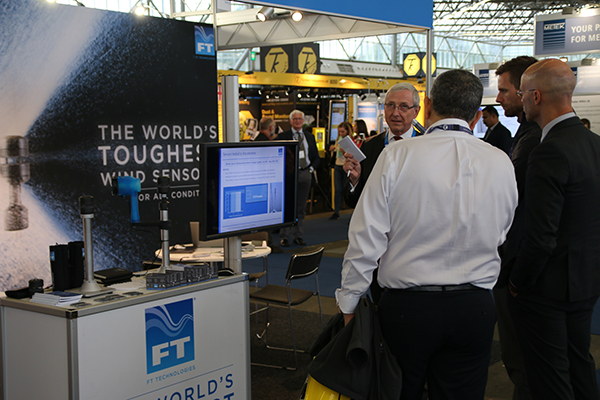 Another product making its debut was FT Technologies’ FT742-SM ultrasonic wind sensor, the smallest model in the company’s FT7 Series. Incorporating its own compass, the FT742-SM has been specifically designed for integration into weather stations, UAVs, buoys and ship-based meteorological systems. Reading windspeeds up to 75m/s (168mph), it is 71.2mm (2.8in) high, and weighs only 252g (0.55 lb). Powered by FT’s Acu-Res tech, the FT742-SM’s compact design makes it extremely rugged. With no moving parts to degrade or damage, it is maintenance-free and able to withstand considerable shock and vibrations. The anodised aluminium body is highly resistant to electromagnetic interference, corrosion, sand, dust, ice, solar radiation and bird attacks. The sensor is sealed to IP66 and IP67 standards and inherently compensates for changes in the air’s temperature, pressure or humidity. Featuring a thermostatically controlled heating system, the sensor maintains its temperature at a user-specified heater set point between 0°C and 55°C. With the heaters switched off, the FT742-SM draws no more than 29mA at 24V DC. However, it can also run at 6V, making it ideal for use with batteries. The FT742-SM can be supplied with either an RS422 or RS485 interface with data in either ASCII or NMEA 0183 format, polled or continuous output modes. Wind speed measurements can be specified in m/s, km/h or knots. Campbell Scientific presented a new weather station that enables data to be automatically collected and made available online almost instantly. The MET300E Weather Station is a new multipurpose, pre-wired, pre-configured weather station that can be purchased with a Konect Global Data Services subscription. This allows an installed station to simply be powered up, and for data to be automatically collected and made almost instantly available online. The company says Konect Global Data Services’ data gathering, archive and display system makes it ideal for any measurement or monitoring application. The company also displayed its new CR-PVS1 PV soiling index remote terminal unit (RTU), which provides solar farm operators with real-time information on photovoltaic (PV) panel soiling, allowing them to make informed maintenance decisions. SONA & ZEN from Sieltec Canarias also made its debut at the show, offering a solution for monitoring clouds and atmospheric aerosol. 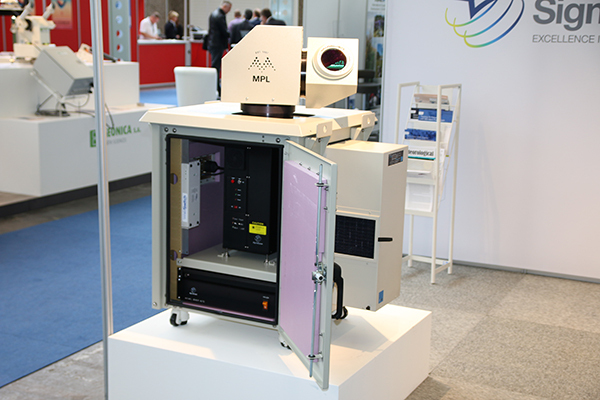 The new system consists of two lines of measurements: real-time data and analysis by capturing and processing all-sky images with a high-resolution camera with a wide field of view, and a zenital radiometer to calculate real-time aerosol optical depth (AOD). Conveniently situated on either side of the exhibition hall, Meteorological Technology World Expo’s free-to-attend Mainstream Conference and Breakout Conference generated heated debate and interest, with a noteworthy presentation from Dr Vladimir Jankovic, senior lecturer at the University of Manchester, titled ‘Atmosfear: Is the economy growing more vulnerable to weather?’ and a technology update on low-cost X-band weather radars from David McLaughlin, professor and associate dean at the University of Massachusetts, standing out as particular highlights. Nearly 40 speakers presented their latest research, thoughts and findings across two streams running the full three days of the event. The conference also provided a perfect opportunity for the discussion of another key topic: how to foster greater public-private cooperation. The second day hosted a dedicated panel discussion between the HMEI, WMO and the World Bank, focusing on the growing partnership between public/private sectors and the World Bank, with an emphasis on project funding and future plans. Another panel discussion on private/public global weather enterprise took place on the third and final day of the show. Speaking live from the exhibition floor on the first morning of Meteorology Technology World Expo 2017, HMEI’s Day also used the show as a chance to call for urgent action from the hydromet industry and its customers to better address poorly written and ill-conceived tender specifications that could ultimately be costing nations millions of dollars in wasted resources. The HMEI-led Tender Specifications Initiative aims to create a useful tool to assist WMO members, in particular from developing and least developed countries, in the creation of their tender documentation populated with vendor-neutral specifications from CIMO Guide-8. 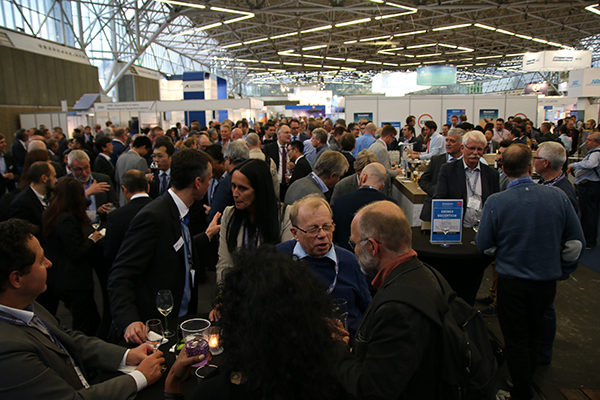 After such a successful show in 2017, the bar has been set particularly high for next year’s expo: the world's largest meteorological event will take place 9-11 October 2018, at the RAI, Amsterdam, Netherlands. The 2018 edition has already been boosted with the news that it will play host to the WMO’s CIMO-TECO conference. To register to attend Meteorological Technology World Expo 2018, click here. An off-the-shelf solution with extensive support and proven performance and functionality significantly reduces the implementation time and total lifetime costs, helping you stretch your budget further. Continuous modernization and efficient upgrades helps you utilize the most advanced technologies available to improve performance now and in the future. Michael Natschke is business development manager at Kisters. In this interview he introduces us to HydroMaster, a live web service developed with MeteoGroup, that allows users to view, analyse and archive historical as well as upcoming precipitation events, giving them access to radar-based observation and forecast data, as well as reﬁned forecast data for their deﬁned hotspots, zones of interest and catchments. Click PLAY to hear more. BloomSky’s director of marketing and sales, Daniel Han, discusses the company, which provides hyperlocal weather information using its global network of smart weather camera stations for personal and enterprise solutions. The networks provide real-time situational awareness of the weather at a highly granular level. Click PLAY to hear more. EFORA’s owner and managing director, Theo Polling, comments on his company, which offers sustainable, portable and quiet energy solutions for remote weather stations by providing bespoke, turnkey and complete industrial power solutions utilising patented methanol fuel cells in combination with solar panels, batteries, chargers and power control units. Click PLAY to hear more. Jules Paquette, general manager at WeatherBrain, unveils this revolutionary new technology that is said to facilitate the integration of environmental monitoring within smart city initiatives. This innovative platform captures localised data and turns it into critical intelligence, leading to unprecedented operational efficiency, cost savings and public safety in smart cities. Click PLAY to hear more. Gerald Spreitzhofer is CEO of MetGIS, a provider of automated high-resolution meteorological forecast maps in multiple languages for around 200 small-scale areas from ski resorts to expedition mountains in remote regions around the world. These ultra-precise forecasts are accurate to just 30m2 and are updated regularly each day, resulting in MetGIS’s forecasts being among the most precise in the world. Click PLAY to hear more. Marijn de Haij is a researcher of observation technology at KNMI, the Royal Dutch weather forecasting service. Here he discusses some of the developments that have arisen from recent studies on new observational techniques, experimental observatories and innovations in the field of data technology and visualisation. Click PLAY to hear more. Kevin Kronfeld is PR systems engineer at Rockwell Collins, a leader in aviation and high-integrity solutions providing advanced technology to enhance flight safety and efficiency for flight operations around the world. Here Kevin discusses the aircraft-nose-mounted Multiscan Weather Radar, with detection ranges of up to 320nm, giving pilots real-time information on the smoothest, most efficient routes around dangerous weather systems. Click PLAY to hear more. Meteoblue’s CEO, Karl Gutbrod, discusses the company, which supplies seamless hourly weather data for any point in the world on land or sea, using cutting-edge science and technology to generate, display and distribute weather information. With over 30 years of weather data archived, commercial users can access historical weather-event data on the Meteoblue website for analysis of climate risk, site valuations, weather-based strategies and other applications. Click PLAY to hear more. 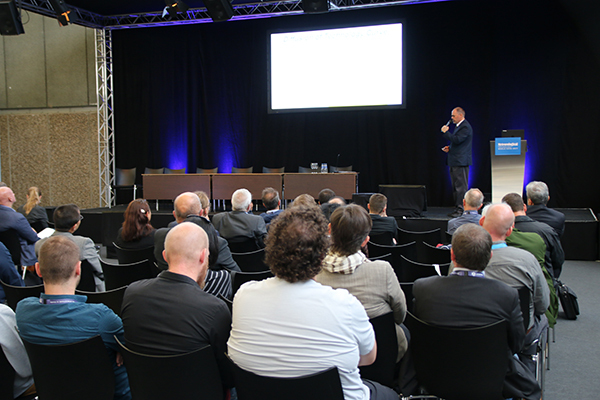 Rudolph Düster, CEO of SEBA Hydrometrie, introduces DischargeKeeper, the company’s latest solution for discharge measurement. It is a remote camera-based, non-contact measuring system for recording the flow velocity profile of the surface and water level of rivers and channels, utilising sophisticated features including direct flow calculation, data storage and remote transmission of data and moving images. Click PLAY to hear more. Dennis Schulze is chief of meteorology at MeteoGroup. Here he discusses the company, which combines accurate science and data with advanced technology and local expertise to provide the most accurate and up-to-date weather forecasts and sophisticated solutions in the market, which are trusted by government agencies and thousands of companies across the globe. Click PLAY to hear more. Martin Fengler, CEO at Meteomatics, introduces Meteodrone, an airborne drone-based weather station developed to research and fill the massive data gap that exists in the boundary layer. It marks the first time that precise information on temperature, humidity and wind in the lower atmosphere has been able to be recorded. Click PLAY to hear more. Click PLAY to hear more. Christine David, CEO of WeatherForce, talks about the company, whose mission is to provide high-precision weather forecasts to promote sustainability in developing countries where much of the population has no access to local weather forecasts. WeatherForce aims to fill this gap by providing fully customisable WeatherForce apps for local communities, to help them better plan around unforeseen weather events, thereby enabling them to organise their work, grow their businesses and, most importantly, prevent local disasters and save lives. Click PLAY to hear more. 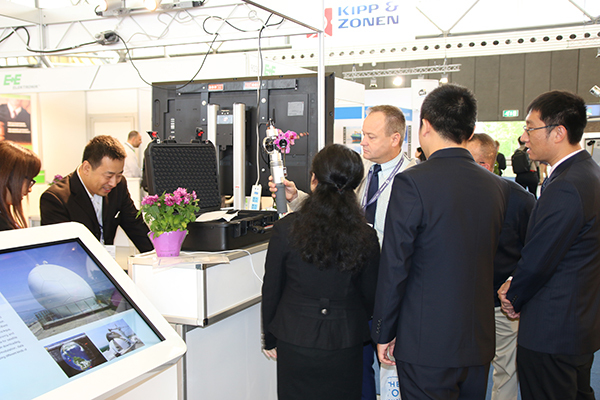 James Zog, stand organiser for Zoglab, talks about the company, which is a manufacturer of specialist meteorological instruments based in China. He introduces us to the HWS3000, a portable handheld weather station that can measure temperature, humidity, pressure, wind speed and wind direction all in one convenient unit. It is being widely used in China for meteorological observations in the aviation, shipping and power generation industries as well as by emergency services. Click PLAY to hear more. Paul Kucera, project manager at COMET/UCAR, talks about the 3D-PAWS Initiative, which is looking to expand weather observation networks into the sparsely observed regions around the world using high-quality, low-cost 3D-PAWS surface weather stations, manufactured quickly using locally sourced materials, micro-sensor technology, low-cost single-board computers and 3D printing technology. Click PLAY to hear more.